I called this one The world will tremble because I like the usage in the trailer itself. The world will indeed tremble when we see an army and upcoming wars between the Vikings and Paris, Vikings and Wessex, Hedeby and Kattegat, and assuming Vikings and Northumbria. I assume that Ragnar will attack Wessex if he is going to raid Paris again depends if he is going to Paris first. Ivar wants to raid Paris with Ragnar end of season 4A. If Ragnar decided to raid Paris first this is one of the things that could become true for Ivar. Unfortunately, if they attack Wessex first it will be the downfall of Ragnar without a doubt.We see him in a cage but this could also be a trick like we saw in Paris. Let´s hope it is a trick but I think it will resemble the dead of Ragnar. 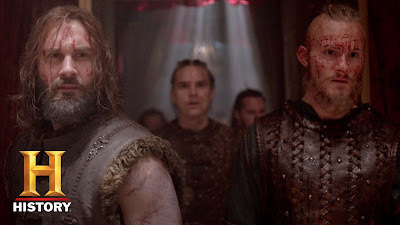 When I saw the trailer we see and hear a couple of things, Bjorn is not so pleased when Ragnar came back when talking to the seer. He needs to curse that day the seer told Bjorn. We see Bjorn shouts charge to a very big army. I am not sure if this is already the "Heathen Army" that revenge Ragnar or if it is a resemble of one army twice as big as before. I even don't know if Ragnar will die and if he is going to die which episode. Lagertha has different things on her mind she wants to revenge her marriage to Ragnar. She wants power and become queen because she thinks she has the right to be queen.Lagertha, therefore, attacks Kattegat it seems. I think she will do that when Ragnar is not around. Or she is doing it with permission of Ragnar. The funny thing is though when you think about it Lagertha loved by everyone why attack the place? In a recent interview, Lagertha (Katheryn Winnick) told it could be a different outcome than we expect. Will this be her dead sentence as well? We see a village burning if we see Floki. It means they are raiding again like the old days. Shall we see old Floki back? The village needs to be an Arabic country because we see clothes from over there. The seer is not dead yet when we hear Bjorn and him talk so will Floki be his successor or is he still the human form of the god Loki? Ivar declares the war to the world by this the world will tremble and everyone will know who Ivar is.